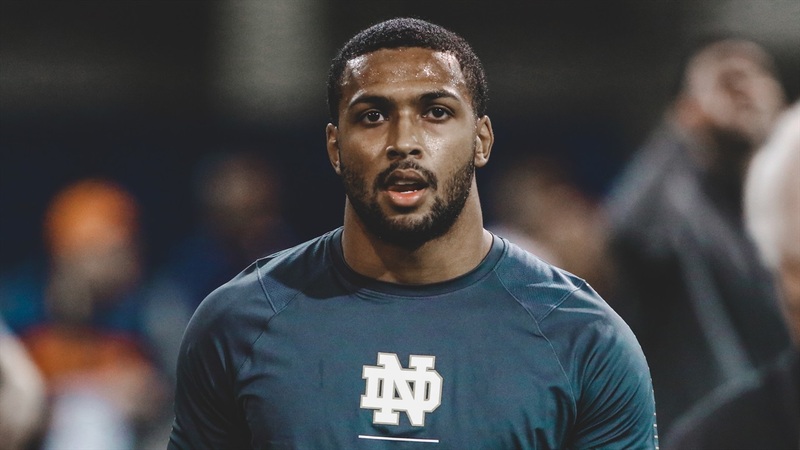 Julian Love wanted to run a faster 40 than his 4.54 at the NFL Combine at Notre Dame’s Pro Day on Wednesday and accomplished just that. The 5-foot-10, 193-pounder ran a 4.45 and Love was more than pleased following his workout. “When you’re at the bottom like my 40 time was at the Combine, there is only one way to go and that’s up,” Love said. Love will give a ton of credit for his growth to Notre Dame cornerbacks coach Todd Lyght, who has coached him since his freshman season. Lyght was in the building on Wednesday and Love admitted he felt his presence. In addition to Lyght, a few former players were in The Gug to watch Pro Day along with several members of the current team. The support was much appreciated by Love and the other Pro Day participants as it’s a high-pressure situation. When it comes to the NFL Draft, Love would love nothing more than to be drafted in the first round, but he also is grateful to have the chance to play in the NFL. “It’d be great,” Love said of being a first round choice. “My family would be happy and I’d be very excited. First round, second round, you’re getting drafted to play football. That’s pretty exciting. People get caught up in the draft picks, order and money. Love impressed many teams at the NFL Combine last month on the field, but teams also gave him great feedback in the meeting room. While teams love his game, Love also boasts a clean resumé off the field and hasn’t suffered any significant injuries, which is also appealing.